Customers: please take note that these coins will be certified by either PCGS OR NGC with a grade of MS64. Coins will be from years of our choice ranging from 1908-1929. Coins will be picked based upon our current inventory selection. The United States Mint first released the $5 Indian Half Eagle Coin in 1908. It enjoyed 8 years of mintage until World War I caused its production to be suspended in 1916. Despite attempts to resume its production in 1929, its mintage only lasted for one additional year. Consequently, it became the last $5 gold coin to ever be produced by the United States Mint. Face value of $5 backed by the US government. 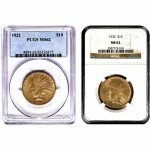 All Indian half eagle coins included in this collection have been certified to have a gold content of .24187 troy ounces as well as an MS64 grade by the NGC or the PCGS. 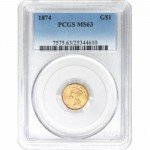 Coins graded in MS64 condition possess an above average appearance that is only mildly scuffed by small contact marks and hairline scratches. 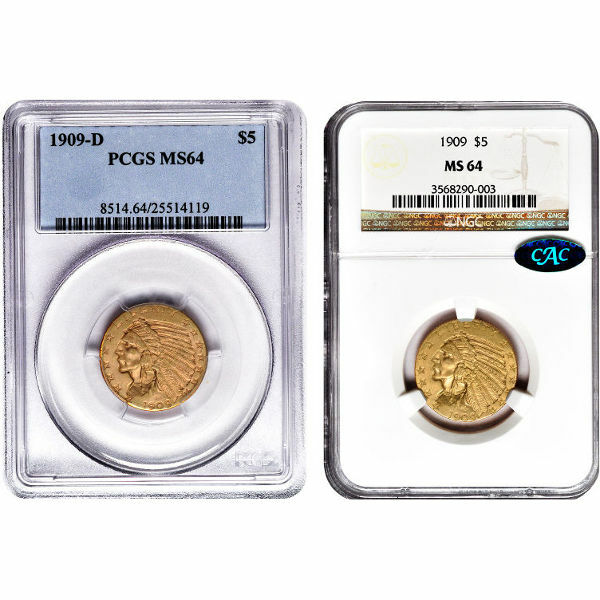 To hinder any further damage, every coin has remained sealed in its original NGC or PCGS slab since it has been examined and certified. Unlike most coins whose images are raised or sculpted on top of their surfaces, Indian Gold Half Eagles have images that have been carved or pressed into their surfaces. The resulting imprint is referred to as a “recessed” design. The only other piece of US currency to possess a recessed design is the $2.5 Indian Quarter Eagle coin. 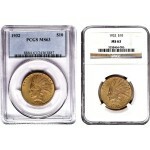 As a result, both of these coins are considered quite valuable among collectors and investors. Prominently displayed on the obverse of the coin is the artwork of designer Bela Lyon Pratt’s. It features the profile of a proud Native American Warrior, attired in his ancestral feathered headpiece. His portrait is bordered by a ring of thirteen stars to symbolize the original colonies. Also appearing above and beneath the warrior are the words “Liberty” and the coin’s mintage year respectively. Equally as noble is the portrayal of our national bird on the reverse of the coin. The image depicts the bald eagle majestically perched upon a bundle of arrows entwined with an olive branch. Printed in the secondary areas of the design are the phrases “E Pluribus Unum” and “In God We Trust.” Our nation’s name and the coin’s denomination are inscribed along the top and bottom edge of the coin. 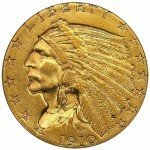 The $5 Indian Gold Half Eagle coin is both a historically and artistically significant piece of currency that will be cherished by generations to come. For more details, please call us at 888-989-7223. You can also reach our support staff through live chat or by filling out the online form located on our contact page.